Wow... my own web space... I almost don't know what to do with it! I guess I'll figure that out over the next few weeks. Here's a picture of John and me that was taken at The Commons restaurant in the Smithsonian Castle. We enjoyed a wonderful lunch there with one of my Internet buddies, who was visiting from CA, hoping to see the cherry trees. 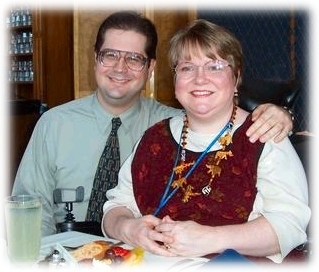 Parents with Disabilities Online - This is my project I manage for parents with disabilities. I really enjoy providing resources, information and support to families like ours, so that they know they're not alone. Birtles Shorrock Goble - Founding members of the Little River Band, who have reunited and gave me the honor of doing their website! Beeb Birtles' Official Website - The pleasure has been all mine to manage the web site for the life and times of Beeb Birtles, a founding member of the Little River Band. DOT Disability Resource Center - This is where I work, and I also do the website for the office. Whitehall Pool and Tennis Club - This is where we spend our summers, when we're not at work, of course! Powerscape, LLC - this is the website for my brother's business, which specializes in commercial power washing services. Trish Knits.com - Here is the site where I will rattle on about my knitting projects. Writings, Ramblings, and other Wastes of Bandwidth - Here's where I'll let you know what I'm thinking, if you should ever care to read. Links - Places I frequent on the web.